Can you imagine having the Minions help you invent a device to help you keep your pants up? We imagine some kind of complicated device that uses magnets and rockets to keep your pants suspended around your waist. Hmm... knowing those rascally little yellow guys, the device would probably malfunction and end up slingshotting your pants into the atmosphere. Those little guys aren't always known for their technological prowess as much as they're known for their wacky antics. Yes, it's probably a lot safer to use tried and true technology when selecting a pants-securing device, like these Despicable Me Minion suspenders. 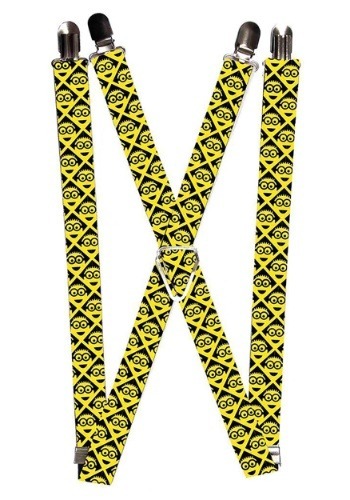 These Minion-themed suspenders help you add some Despicable Me style to your outfit! They're made from a nylon material and have a Minion print on the exterior. It affixes to your pants with adjustable metal clasps, which allow you to change the fit to suit your needs. It's made in the USA and it's officially licensed from the movies. If you're a fan of Kevin, Stuart, and Bob, then you need these suspenders. If you're just a fan of keeping your pants up with a simple solution, then these suspenders are also for you!